2011 climbing trip … number 1? There are many reasons I love visiting the desert; this image captures several of them. The spectrum of contrasts is ever stunning to me: skinny, plump, pale, deep, dead, alive, dry, wet … there’s no reason to stop looking. That said, I was way overdue for a climbing trip, and those often venture into desert lands. We decided on Moab, Utah. Camping! Even at a busy KOA during a huge Jeeper event, it was refreshing to sleep in the outdoors, even though we got that last campsite because it was the one next to the playground. Thank goodness for quiet hours! The added beauty of a KOA: if you elect to fuss with contact lenses, the fully functional restrooms are a life (or at least eye) saver. Especially if one lens falls out of the one pair of glasses you bring as backup. The rock climbing was awesome. My 5.8 trad leading skills didn’t get much practice, unfortunately, but I got to work on my crack and slab technique. Luckily we had some really strong climbers around, to lead all the harder climbs we were doing, so that I could at least top-rope them. That sandstone, often polished, or dusted with sand, was challenging! 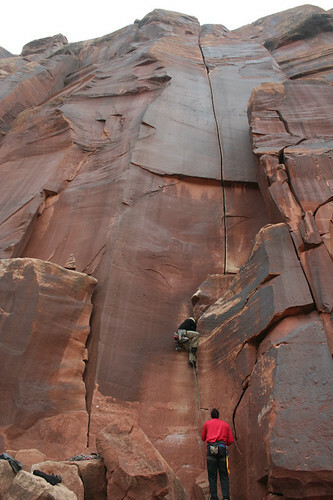 We climbed at the Ice Cream Parlor, Wall Street, and Indian Creek Supercrack Buttress areas. Wall Street was a little sandy, as we got there after a rainy day. I was astonished to discover that I had the ability to climb at the Indian Creek area. I’ve been hearing about it for years – how fantastic and how hard the climbing is. But the crack-climbing skills that I’ve been working on for nearly 10 years are strong. Wow! I’d like to thank the academy, namely Jeremy and Josh, for teaching me their kung fu. Photo at right is Josh using the aforementioned kung fu on his lead of Supercrack of the Desert, which I later top-roped. My decision a few years ago to only go on climb trips with good friends (versus paid guides) was sound. These people I love and trust. The laughs are worth every cent and drop of sweat or blood that was involved in making the trip and fitness happen. Iffy weather allowed us the hiking/photography days that I had desired. 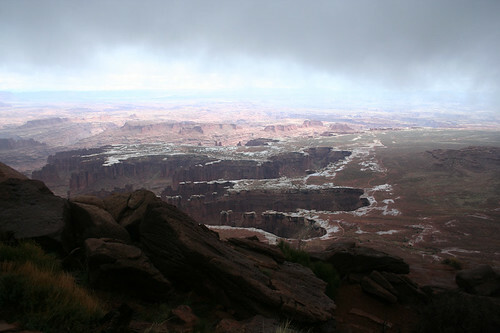 Canyonlands National Park and Dead Horse Point State Park are amazing, otherwordly places. I think we got there just as wildflowers were starting: we saw no flowers on cacti. I have finally nailed a packing list for spring trips to the desert. I was warm enough, and dry enough, for the most part. 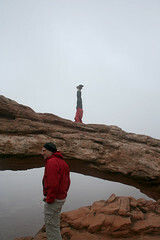 On that bridge – “Mesa Arch,” headstand or lotus pose made the most sense, energy-wise, but standing in front of the arch, the balancing, upright nature of tree felt right to me. On my first climbing trip since I really dug into my yoga training, a balancing pose seems appropriate. We swing far to one direction, then far to another, and eventually find center. Many more of my own trip photos are here. Joe’s are here. Enjoy! Next trip: maybe back to Moab? I have a few climbs picked out, and we missed out on some awesome multi-pitches. But the Gunks are still calling me. Or I could make another visit to Smith! Next ›The free man’s yoke.